Sell-offs across the board today for stocks. Can’t say it was all that surprising after a 1200 point Dow rally in less than 2 weeks. But 250 Dow points certainly make for good headlines. What do we make of all this? I think the next two charts will help us determine whether or not the previous set of charts will be able to battle it out and breakout, or if today’s declines are the start of a much further correction. We have discussed for a while here that the Nasdaq100 has been outperforming across the board. Last week’s breakout to new highs is being tested right now. 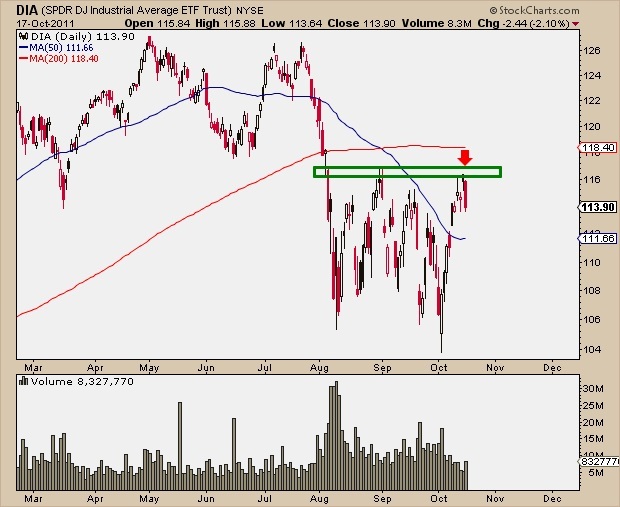 Was this a false move that will lead to a fast move down – leading the rest of the above charts much lower? Or is this just a test of new found support for the leaders, before the uptrend and relative outperformance continues? 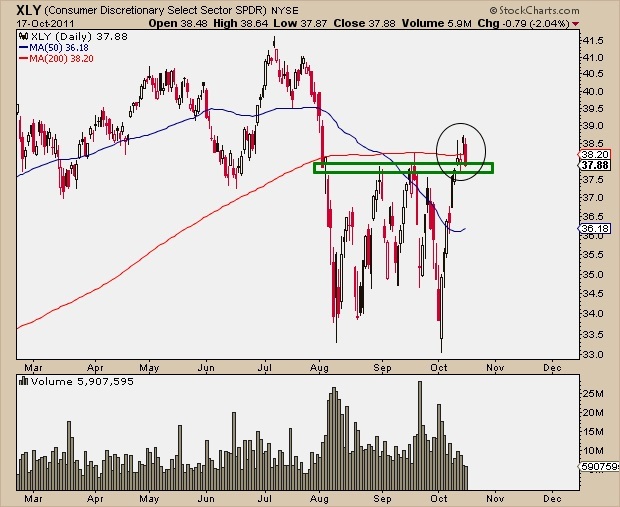 Same thing with the Consumer Discretionary sector. After breaking out to new highs last week, we tested former resistance (and possibly new found support) today. Like the Nasdaq100, is this a false move that will lead to a fast move much lower? Or just a healthy retest on it’s way to higher highs? 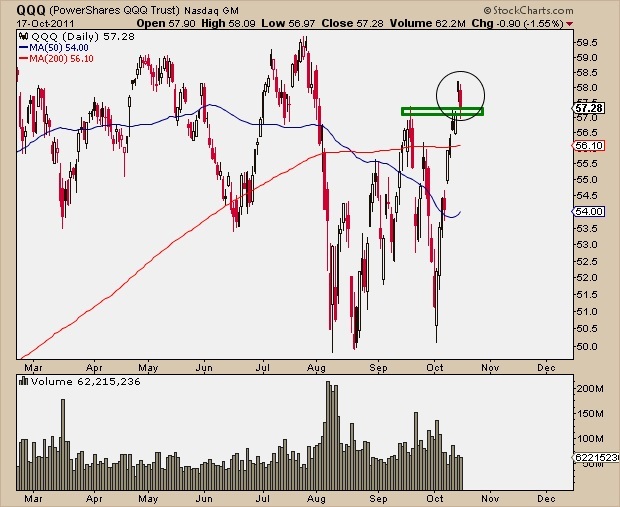 I think the last two charts of $QQQ and $XLY will really help determine the next direction for the broad market. For now, we’ll classify today’s move as nothing more than recognition of logical supply. We will know as this week progresses if this is the beginning of something more. The last 2 charts will be our tell. The recent disconnect between the Stock Market and 10-Year US Treasury Bond Yields seems unsustainable to me. Since the late 90s, stocks and Treasury yields have been positively correlated. In other words, if bond prices rise, then the yields of those bonds fall along with stock prices. The opposite is also in that when bond prices fall, bond yields rise and so do stock prices. Treasury bond prices have exploded higher over the last few months as stock prices got crushed. But it’s the yields, breaking below their 2009 lows, that concern me. Is the bond market telling us something about future stock prices? 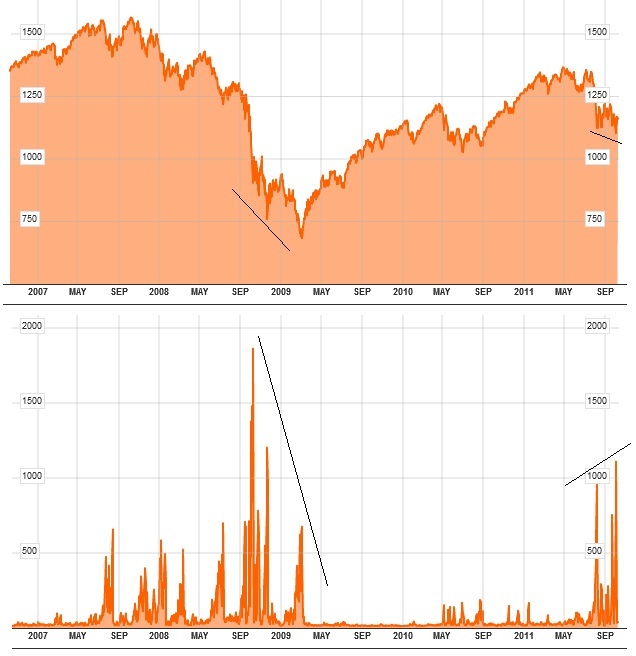 The S&P500, even after its massive declined off the Spring highs, is still well above the 2009 bottom. In fact, it’s not even close. The S&P500 is still 80% above those bear market lows, while last week, Treasury yields hit fresh lows down near 1.8%. You could argue that the recent disconnect is the result of Federal Reserve’s manipulation of the Bond Market. Since 2009, the Fed has been proactive in keeping rates at low levels. The Stock market seems to like that. Asset prices are being rewarded and heading higher, but it doesn’t appear to be helping the real economy. Earnings season is upon us and as usual, the big banks are one of the first groups to go. JP Morgan ($JPM) reported their earnings yesterday and despite beating estimates, the stock sold off all day. The disconnect between earnings reports and the market’s reaction to that news is nothing new. Historically about 70% of companies in the S&P 500 beat the analyst estimates, but I think at this point we know the game is rigged. Companies guide and point the analysts towards conservative estimates, making it easier on themselves to beat expectations. Apple is probably the most infamous for doing stuff like this. On the golf course, we call them sandbaggers. You get beat up for stuff like that where I come from. In the market, you sometimes get praised for it. Amazing. But traders have caught on to this little game. As a technician, I tend to care more about the market’s reaction to the news, not the actual results themselves. Notice how historically the P/E ratio in the S&P500 would to peak in the low to mid-20s. This went on for almost 100 years until market participants were willing to pay much higher multiples for these silly dot-coms. 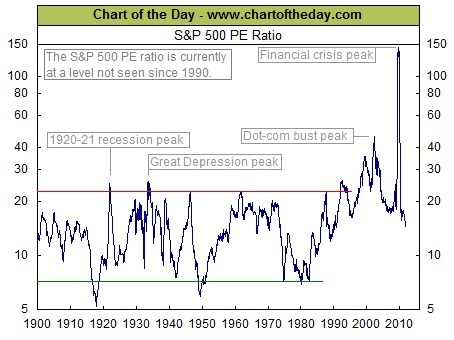 But this was nothing compared with the peak in P/E during the financial crisis. Stocks got slaughtered as the market priced in future earnings declines. Talk about unprecedented levels. We are now back at normal P/Es where some might even say that the market is cheap. But can it get cheaper? Of course. The problem here is the “E” in P/E. We don’t know what the earnings are going to look like. All we have are estimates – and they’re always getting revised. If we have a recession, and some could argue that we’re already in one, then you could see the typical 30% haircut in S&P earnings. Where would that put P/E ratios when you ask yourself what multiple you would put on those “earnings”? Just a little food for thought going into the weekend. This map was put together by an MIT graduate student. It was created by taking NASA’s earth at night map and subtracting Facebook’s friendship connection map. How cool is this? Very nice job. Go check out what else Ian Wijtowicz has put together. But here is the problem: $30.30-$30.50 was very important support that goes back to December last year. 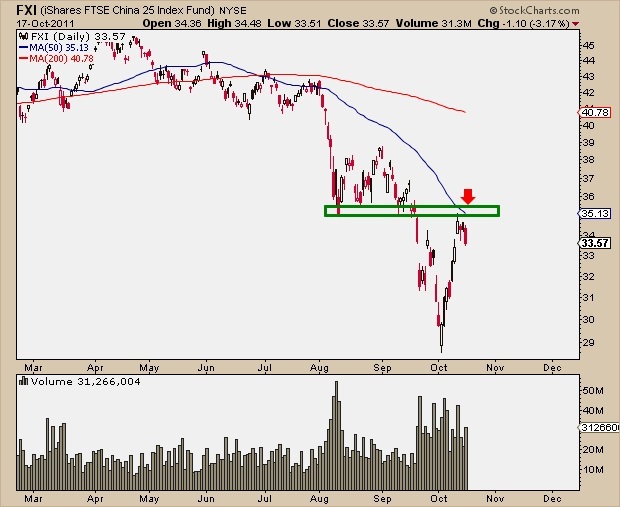 This key support (Green box) was tested successfully in the Spring and then again early in the Summer. It wasn’t until the 5th test at the end of July/early August that $SMH broke and got clobbered. I had the pleasure of attending the Big Picture Conference yesterday and heard Doug Kass call Technical Analysis: “Voodoo”. He then went on to say, “except for key support and resistance levels”. 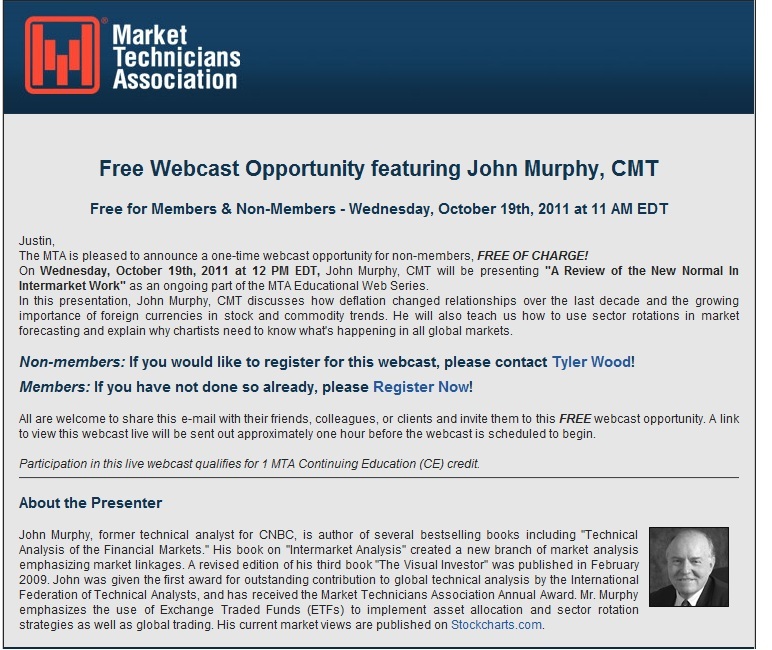 Doug: With all due respect, what the hell do you think technical analysis is? It’s a study of supply (resistance) and demand (support). Period. 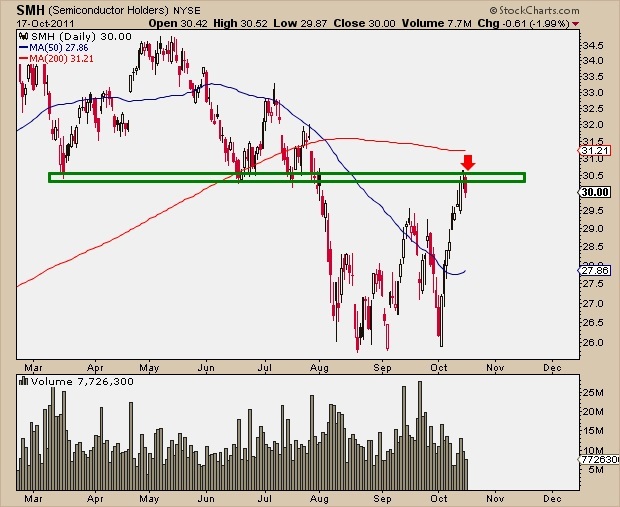 This chart of semiconductors is a good example of this. 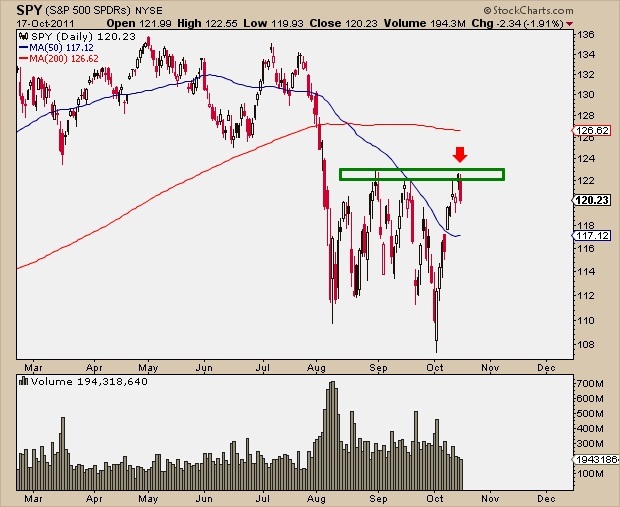 In December last year there were buyers at this level. In March, there were buyers. Then again in June – Buyers. Eventually, anyone willing to buy at this price will have already bought. This is when the chart breaks, because the only participants left are sellers. That takes us to where we are today, attempting to get back above that level. We know from our previous statements that these price levels are full of sellers (because the buyers ran out right?). This key resistance is why $30.30-$30.50 means trouble. Meanwhile, a few of the big components in the ETF are running into some resistance of their own. 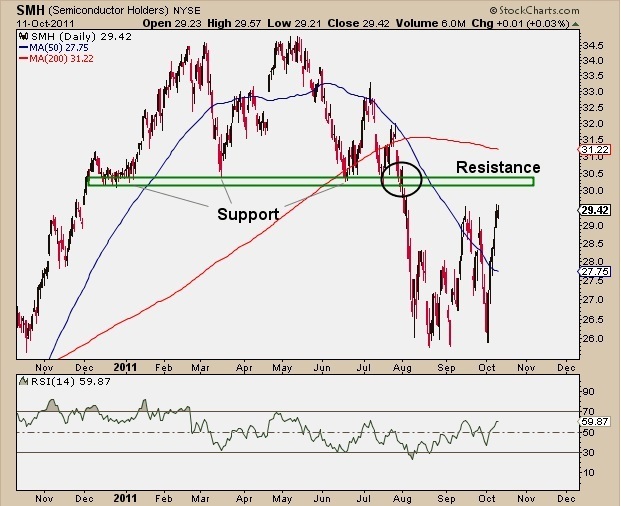 Intel ($INTC) is bumping up against multi-year resistance around 23-23.50. Applied Materials ($AMAT) has been under-performing relative to Semi’s as well as the broad market and is currently bumping up against it’s downward-sloping 50 day Moving Average. But Texas Instruments ($TXN) still seems to have a little room before getting to resistance around $31.50-32.00. I don’t see Semi’s breaking through this former support without a battle first. And I can’t imagine the Nasdaq Party being this wild without further participation in the chip stocks. We are all participants in this “Market of stocks”, and not necessarily the “Stock Market” itself. I know that it’s cliché and we hear this a lot, but let’s remember what it actually means. We always focus on the major indexes: What are large-caps doing versus small-caps? 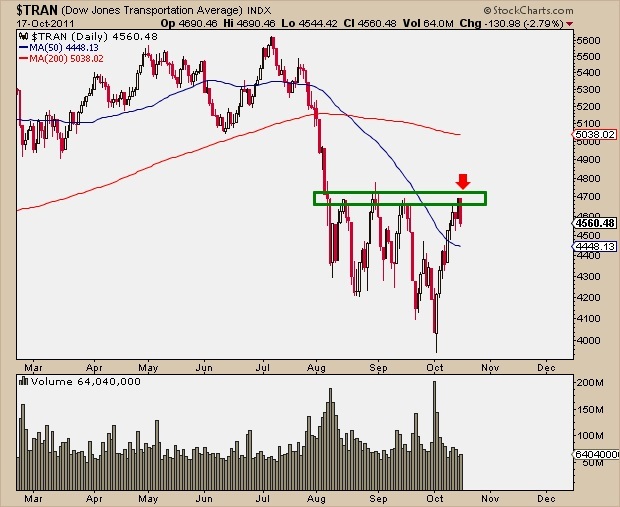 What is key support for the S&P500 or Dow Industrials or Nasdaq100? But each index is made up of individual components: 500 companies or 30 or 100, depending on which one we’re looking at. The internals represent what the actual stocks are doing. They tell us a lot about the index itself, not just the other way around. Back in 2008-2009, as the S&500 and Dow Industrials were making lower lows in price, the internals were strengthening. The most amount of 52-week lows that were made on the New York Stock Exchange came at the October lows. In November, the indexes hit lower prices, but fewer stocks made 52-week lows, the first sign of internal strength. Then in March, the indexes made even lower lows, but once again fewer individual names confirmed. Last Monday and Tuesday the S&P500 broke below the August 8th lows. This time, even more lows were made on the NYSE. So we’re not seeing the internals strengthen yet like we saw at the 2009 bottom. I don’t think that it’s the end of the world. We can still have a decent rally. But we need to see more before we can say that a new sustainable bull market is here. The overhead supply at 1260 in the S&P500 and 11900 on the Dow is for real. 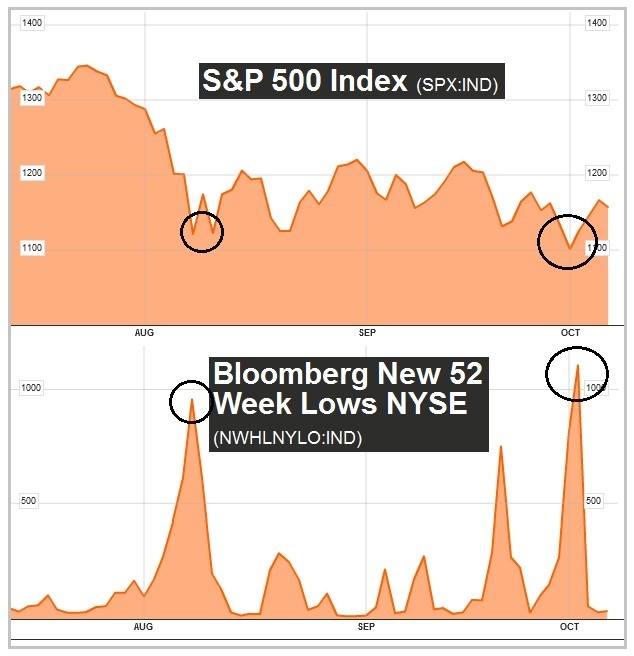 I think the amount of 52-week lows last week exceeding that of the previous market lows in August confirms that.